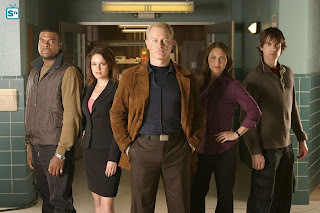 I have just rediscovered Medical Investigation - I'd forgotten how much I used to enjoy that show. Anyone else remember it? They are a team from the "National Institute of Health" who go in and figure out why people are dying, then sort it all out. It was surprisingly upbeat considering the number of people who kick the proverbial bucket in it :). It was back in early 90s and stared, among others, Christopher Gorham (young chap on the far right of the piccie). That was back when it seemed that anything he was in was doomed to only last one season :). Oddyssey 5, Jake 2.0, this one - they all got cancelled, which was very frustrating. Good god, he's only 2 years younger than me (just checked his IMDB) - one of those baby faced actors, I guess. I also love Neal McDonough who has the most amazing eyes (chap in the middle) and seems to show up playing baddies a lot. Actually - I really like all the main cast. Kelli Williams went on to be my fav in Lie to Me; Anna Belknap was awesome in CSI: NY; Troy Winbush is one of those actors who shows up in everything :). They were a great ensemble cast - it's a shame the series didn't go any further. Of course I suspect the writers were running out of deadly outbreaks that made good drama without being utterly icky. My schedule still seems to be working - manages to write 16K words last week and have already produced 3.5K this week, so the whole alarms telling me what to do when seems to be working :) Need to set up a different set for Mondays though, because I do the weekly shop first thing in the morning, which buggers up my schedule a bit. Nearly have a new short story finished - just one scene to go. Of course it's THAT scene - y'know the one. It's supposed to be easy, but it refuses to reveal how it's supposed to go. I've written it twice so far and discarded both. With me luck for getting it done today. It's part of a series I'm planning called Re-Forged Fairy Tales with main characters with alternative sexualities to the usual heterosexual, CIS focus of these things. This one is a bigender Little Red Riding Hood. The next will hopefully be asexual Cinderella. I haven't planned any farther than that :). This entry was originally posted at http://beren-writes.dreamwidth.org/344851.html.